Ecko Canada has released what is in store during their Black Friday Canada 2014 event! Shop at Ecko Canada locations on Black Friday November 28th, 2014 to enjoy the hot savings! On Black Friday November 28th from opening until 1 PM, you will save 50% off the entire store including regular and sales priced merchandise! After 1PM, you will only be able to save 50% off of select regular priced merchandise. This offer is valid on Black Friday November 28th, 2014 only. This offer is valid online as well - except the 50% off is sitewide and starts now! Save on sweaters, hats and other apparel items that would be excellent for yourself or for under the Christmas tree this Holiday season. Click here to shop at Ecko Unlt to enjoy their Black Friday Canada 2014 sales and deals. Ecko Unlimited Canada is having a fantastic Pre Canadian Black Friday Sale! For a limited time, shop online at Ecko Unlimited and you can save 50% off Ecko Red Jackets, Track Pants, Long Sleeve Shirts and more during this Red Alert Fall Clearance Early Black Friday Sale! This offer is available online only. Also, if you spend $80 or more at Ecko Unlimited before taxes and after discounts during this Pre Black Friday Sale, you will enjoy FREE Standard Shipping. Click here to check out this Ecko Unlimited Canada Black Friday Sale! Shop Canadian Black Friday 2013 at Ecko Unltd in the Scarborough Town Center! Their Black Friday Canada promotion boasts 50% OFF between 8am and 12pm on Ecko regular priced items, and 30% OFF between 12pm and 9pm on Ecko regular priced items! Please see in store for more details. 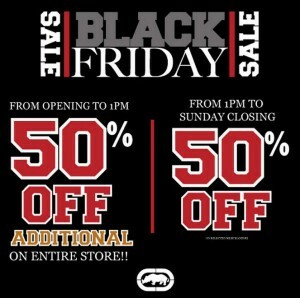 Ecko opens at 8AM on Black Friday, November 29th. Ecko Unltd. is driven by a simple belief: that no one needs to be corralled into a single aesthetic. It's a philosophy that takes the form of tees, outerwear, denim, woven and knit shirts, watches and hoodies. They are dedicated to giving young men and women a chance to be their true self. It's a line that looks at the world with curiosity, finding inspiration wherever possible. 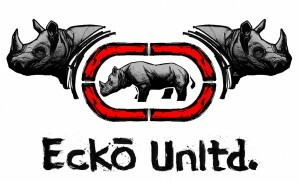 Their styles include skate culture, action sports, artist, music... why just be one thing when you can be Ecko Unlimited.